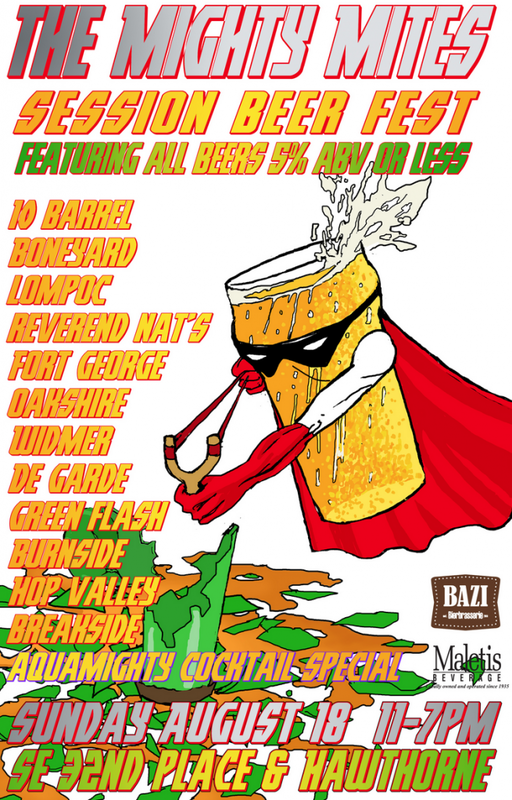 The Session Beer Project™: Return of the Mighty Mites Session Festival! Return of the Mighty Mites Session Festival! The West Coast is most definitely getting session beer, despite what you might think, given their predilection for big fat IPAs and DIPAs and such. Last year there was a big session fest in Portland called Mighty Mites, for instance...and this year, they're doing it again. PORTLAND, Ore. — In a world full of Double IPA’s and Imperial Stouts a hero will rise to stand up for the small, lighter, sessionable beers of equal flavor and tastiness. Faster and tastier than a can of Silver Bullet, The Mighty Mites session beer fest is back for a sequel on Sunday August 18th as part of the Hawthorne Street Fair in front of famed bier bar Bazi Bierbrasserie. Featuring beers that fall under the “Session” style category as defined by being 5% abv or below [I'll take what I can get...and check the ABVs below; most of the brewers get it.] The Mighty Mites presents a selection as varied as they are flavorful from single hopped IPA’s to tart refreshing Berliner-Weisse’s and Lagers and even a session Cider; our taplist has multiple Great American Beer Fest medal winning beers. These types of beers are perfect for quaffing multiple pints without filling yourself up or over indulging in alcohol and the Mighty Mites street party will make for a perfect summer respite as part of the Hawthorne Street Fair. As part of the annual fair The Mighty Mites will be the only beer garden on the street and the only full street closure on 32nd place just off Hawthorne marking the west side of where the street fair begins. Reverend Nat’s Hard Cider: “Session-Style Ciderkin” Under 4% ABV. Burnside Brewing: lowercase IPA - At 4.8% ABV and 50 IBU. Eel River: Cali Pale Aromatic dry hopping with Simcoe and Citra hops, 4.8% and 38 IBUs. 10 Barrel: Swill [Been hearing a LOT about this beer.] Grapefruit infused Berliner-Weisse with soda added. More beer and less soda than the traditional radler makes for a great summer beer. 4.5%. Widmer: Portlander Weisse 3.4% ABV. Peach ginger and blackberry coriander syrups available.